Day Two in San Francisco, I checked in with David Blaine, via ABC. He said he likes to challenge himself because it challenges others, "you will ask yourself, 'could I do that?' In those moments of wonder, is magic." David Blaine was in the 24 hour zone suspended 5 stories above NYC. He reported that he underestimated it, "I misjudged this one," he said, "but I think I can get it done." I liked this: A reporter asked him, "Do you see the world differently?" His answer: "I thought I would, but no." After my DB check-in, I dressed and hit the streets. 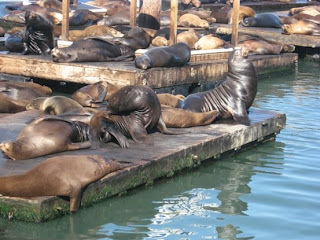 Walked the few blocks to Fisherman's Wharf, a seriously touristy area, but I was in the mood. 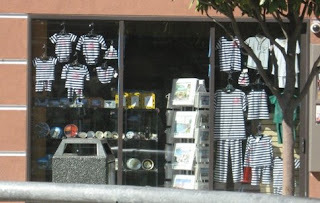 Check out these Baby Alcatraz outfits -- hey, give little Junior a headstart on his life of crime. 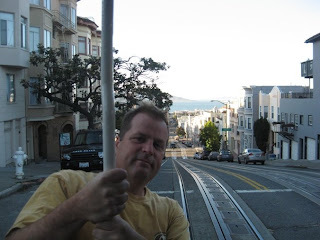 I hung a left and walked a few blocks up to Ghiradelli Square. The square is mainly a shopping area in what used to be the chocolate factory, I believe. There is a self-guided walking tour with the history there for you to read. It's very interesting, I read it on previous trips. I sat out front in the park on the waterfront and read awhile. 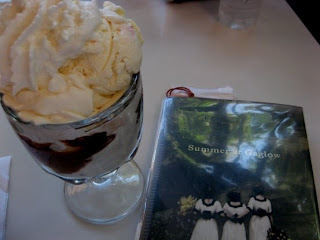 Then I headed inside for a hot fudge sundae. Another San Francisco must. 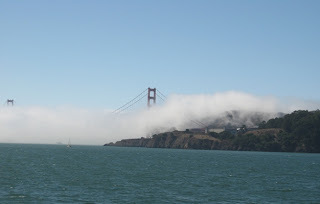 I watched the fog rolling around the Golden Gate Bridge. I meandered back to Fisherman's Wharf and caught a ferry just so I could get out on the water. It was warm, which is odd for San Francisco, it's usually chilly out there. I popped into the Starbucks on Sausalito and did a little shopping at Hubba Hubba's -- awesome clothes & awesome salesclerks. Before long, it was time for Tom S. to come out and play. We had a good time bopping around. Went to Union Square, up the bazillion floors in the Macy store to the Cheesecake Factory on top. Sat out on the deck and wrestled with pigeons for our fried macaroni and cheese. Then we each had a slice of cheesecake. That's a perfect place for dusk. 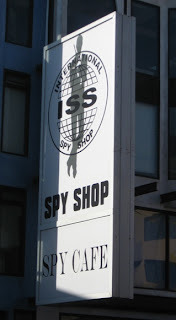 Before we hit the nightlife, we buzzed through the Spy Shop back over by the waterfront. They have some seriously cool stuff. Did you know someone can purchase an item to put on the outside of your door peephole so they can look inside your room/house?? From now on, I'm blocking my peephole with a hunk of chewed gum. There was a pen that's really a digital camera and some headphones that enable you to hear conversations that are far away. Oh man, we wanted some of that. That sums up San Francisco By Day. My next post will tell you about the nightlife. Hope you enjoyed the tour. Remember, tips are always appreciated.